"When your head is in the clouds, you may be inclined to fidget and quake until you can see a green mountain with hundreds of birds". 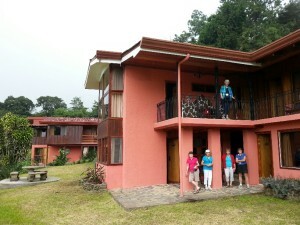 "Head is in the clouds" refers to the cloud forest where we stayed on Nov 1 at Fonde Vela Hotel. "Green mountain" translates into Spanish as Monteverde, the nearest town, and a very popular tourist destination. It was founded in 1951 by North American Quakers, hence "quake".